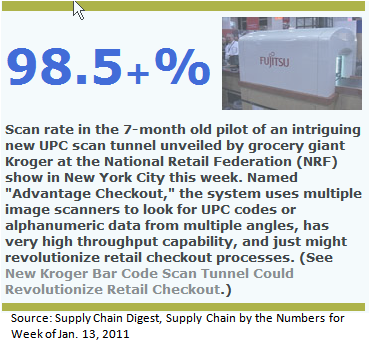 Supply Chain Digest’s series on Supply Chain by the Numbers for Week of Jan. 13, 2011 cites a Kroger pilot with read rates exceeding 98.5%. The pilot is built around reducing the manual touches during the check-out process. As the products move through the tunnel, their bar-codes are read and accounted for, an OCR (optical character recognition) system supports the bar-code reader by identifying products where the bar-codes may be unreadable. Any items that could not be “read” using the bar-code reader or the OCR device are handled manually at the end of the tunnel to finish the check-out. This was showcased in the recently concluded NRF 2011. The system can potentially reduce billions of manual touches during the check-our process as well as provide substantial improvements in loss-prevention and inventory accuracy processes. All of which should provide Kroger with definite cost-savings and a much improved replenishment capability in its stores. Another possible inference? SC Digest says that, “the development of the system is obviously a bet that item-level RFID tags capable of being read en-masse or at high speeds are not coming to the grocery industry any time soon – else Kroger or any retailer would not have made the investment in this UPC-based technology”. This view is corroborated by Kroger’s CEO as well. Where does that leave RFID at least for now? Well, RFID is in a great revival as well – with a host of retailers adopting RFID technology to manage their store replenishments from their back-rooms as well as to manage their receiving and shipping operations in the warehouses by adopting RFID tags at case, pallet, and/or LPN levels, in addition to renewed efforts to kick-start the item-level tagging. American Apparel reports 99+% inventory accuracy in their store pilots, Wal-Mart re-launched its RFID efforts at item-level with apparel. J.C. Penney has been another big retailer actively toying with the RFID tags to better manage its supply chain as well as stores. Once the technology matures and item-level tagging becomes mainstream, the POS & check-out processes should also be able to leverage RFID tags!